A puzzle game starring Toad who has become lost in Wario's Woods. He must clear the creatures from each tree if he is to escape. 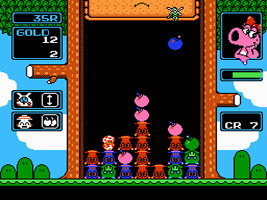 Line up groups of two or more enemies of the same color horizontally, vertically or diagonally, then line up a bomb of the same color and all of the creatures in the line disappear. Toad will also have to beware when Wario appears, as the ceiling will drop down, reducing the play area. Toad is challenged on his adventure by strange creatures under Wario's control. Every 10 rounds he will have to compete against an enemy.